The 34th edition suffered the worst conditions ever: icy (3-4°C) blasts of up to 18m/second assailed the runners, with persistent rain. Top runner Andreas Bergstedt described the absurdity when runners hit a wall of wind at the halfway mark: "one of us cracked up, and started to laugh unrestrainedly". 15, 968 runners started and 14, 686 completed the race. Given the harsh conditions, the 8% dropout rate was a surprisingly low figure. Whoever would have expected a Jordan runner to win? Methkal Abu Drais started modestly and progressed through the field, overtaking Ethiopia's Dereje Debele Tulu in the final kilometres. No Kenyan made the top-20. 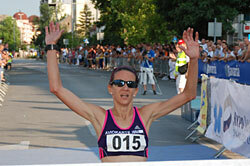 Derebe Godana dominated the women's race from the start to win by over three minutes. The weather was beautiful as runners ran under the midnight sun in the 20th edition, featuring a new name, a new distance and new courses as well as setting a participation record of 1990 runners. 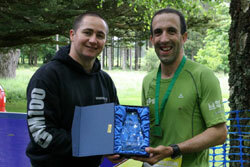 5km was most popular with 1028, 803 in the 10km and 159 took part in the first half marathon. Yeberqual Melese, 22, triumphed among the women today, with a personal best, while Nicholas Kipkemboi of Kenya won among the men. Following the third edition wins are now 4:2 in favor of Ethiopia. Kipkemboi, along with Henry Kiplagat, separated from a pack of four after 15km, with race favourite Daniel Chebii already dropped. 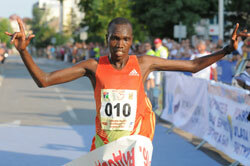 Kiplagat, finished second, for the third time in Czech half marathons this year. The first Czech runner was Jan Kreisinger in eleventh. Great crowd support helped Petra Kamínková to seventh: "At the finish line, I felt shivers throughout my whole body." The Czech-American Eva Chase finished close behind, with 49 year old veteran Ivana Martincová in 10th. The warm summer evening brought a record 3700 runners, among them former Minister of Transport, 66-year old Jaromír Schling, a man with a heart transplant. Bonface Kirui dominated the men's field from start to finish. Extremly hot and humid conditions challenged the whole field. The women's race started strongly with Serbians and the Pole Agnieszka Ciolec leading, but after 4km Croatia's Lisa Stublic took over and went on to win. The hot weather brought out spectators to cheer the athletes on as they passed through the streets of Brcko. Enjoying greatest support were more than 6,000 kids that took part in age group races through the sunny Saturday afternoon, the highlight of this event, as every year. Olympic-bound Reid Coolsaet was only six seconds shy of the course record as he came down from 230 kilometre weeks of training for London 2012, to 190 this week for the race. 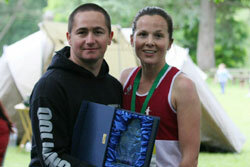 Krista DuChene, a 35-year old mother of three posted another PB in taking the women's title. Conditions were almost perfect for the 4,500 runners from 22 countries who took off from the University campus at 07:30 on the majestic course down to Stanley Park: 11°C, sunny with some cloud cover, and no wind. Another 2,000 took part in the accompanying 5km in the park, and together they raised an impressive $630,000 for 60 local charities in the Scotiabank Group Charity Challenge. Coolsaet dominated from the start. An early pack of seven was down to three by 13km. They hit 15km in 44:49, then Coolsaet went to work. After 3:11 and 3:08 kilometres, he put in a 2:56, then dropped the hammer on the downhill slope through Kits Beach. From 16-17km he opened a 10m gap. 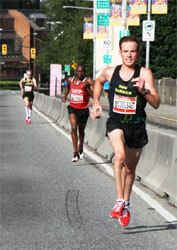 The race looked over, but three-time winner Kip Kangogo closed down Coolsaet as they hit 18km and the strategic 600m climb up the Burrard Bridge. Here Coolsaet showed his strength, holding off Kangogo and then going hard from the top. "It was fun today," said Coolsaet. "With seven weeks to the Olympic marathon, I feel good." The women's race lacked the drama of the men's, as Krista Duchene sailed clear. Lanni Machant didn't challenge as expected, dropping out at 5km with foot problems. 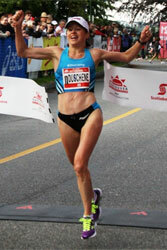 DuChene chased Kenyan Anne Jelegat, as the Kenyan faded in the later stages. She struck decisively at 15km to cruise in for the victory, posting a personal best time by more than a minute and a half. A group of 10 runners exchanged the early lead in the men's race. Then the 19-year old Kenyan Kiprop Limo moved to the front, reaching 7km with Ethiopian Zelalem Regasa who then broke away with only Limo staying close, 4-5 seconds behind. In the last 500m Limo upped a gear and went on to win leaving second place to Regasa, 4 seconds behind. Four runners closely contested third until Eric Sebahire overtook Kenendy Kipyeko. Altogether more than 1600 runners took part.